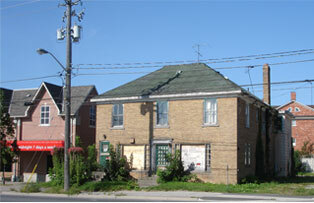 Maple Villa is part of the Maple Heritage Conservation District north of Toronto. This two-storey commercial structure with mid-century modern and arts and crafts influences was built by Howard Wright in 1941 to be a modern restaurant, then called Maple Villa.The building had been vacant for a number of years, and was severely damaged by vandalism and environmental deterioration. Respecting the surrounding heritage streetscape, BridgmanCollaborative rehabilitated the historic exterior and renovated the interior in 2012 to ready it for contemporary commercial use.